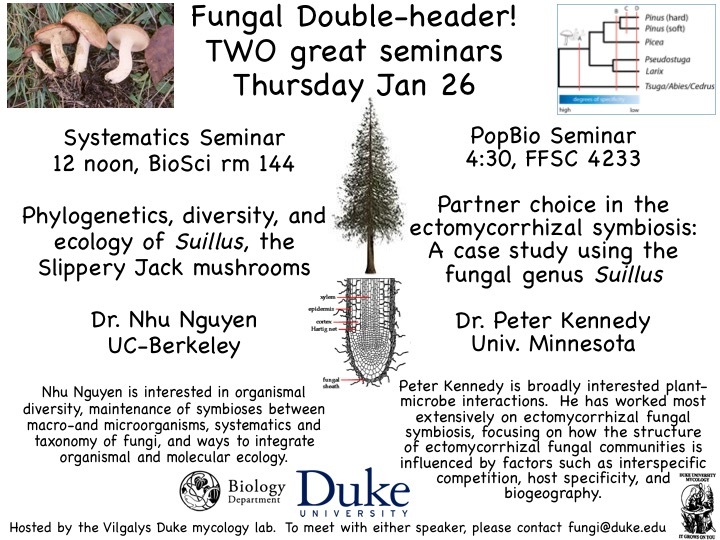 In January, we hosted a visit by Peter Kennedy and Nhu Nguyen, who with Sunny Liao are coPIs on our recent NSF grant to assemble the first ever genome-based phylogeny for the genus Suillus (see Research Page for more details about the project). During their visit, we discussed grant objectives and made plans for future work on this project. (Update – March 2016 – Congratulations to both Nhu Nguyen and Sunny Liao who both recently accepted faculty positions- Nhu at U of Hawaii, and Sunny at U of Florida! We’re all very excited for their future and the prospects for further work on Suillus.